I am actually not the biggest Mexican food fan in the world. I really don't eat enchiladas or burritos, and I detest baked beans. But I do enjoy a good taco. My mom has made the following chicken taco recipe for years, and is a very simple, easy to make recipe. It is probably not the most traditionally Mexican recipe in the world, but it is a dish that my husband and I both enjoy. This is not a spicy dish in the slightest - it is actually a tad sweet because of the presence of the raisins. 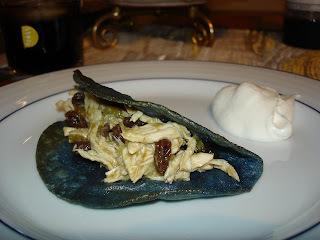 I have made a few modifications to my mom's original recipe (mainly in that I do not put in black olives), and that I serve the tacos in blue corn tortillas because I have a fascination with blue and purple food. In fact, I have read that there is such a thing as purple (and also green and orange) cauliflower, so one of my goals going forward is to find these cauliflower for sale somewhere in the New York area and hopefully either myself or one of the local guest writers will snap some photos of the purple vegetables. You can boil the chicken and once it cools shred into small pieces. Mix with the other ingredients and cook about 10 minutes. To prepare the shells you should purchase blue corn tortillas (or regular corn tortillas) and fry the shells in oil to make them into tacos. Another note on some upcoming features I have in the works: I am working on two chef profiles - one of a 31 year old chef who owns a Michelin starred vegetarian restaurant in Napa and another of a chef here in New York with interesting ethnic influences, who has a new cookbook out. In addition, please stay tuned for some upcoming roundtable features on this blog, including a series of posts on risotto, (more) dishes made using carrots and a Virtual Valentines Day Dinner hosted right here on akitcheninbrooklyn.com.